Nothing became this season so much as the leaving of it. 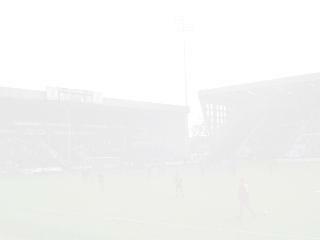 Notts were about to enter administration but that was hardly to blame for another poor campaign on the pitch. In addition, and largely as a result of this, there was another round on the large carousel that we know as the job of Pies manager. Jocky Scott started but as Notts failed to improve on the dismal showings of the year before, he departed and Gary Brazil came in. A few more poor results and performances and the baton was handed to Bill Dearden - then doing well with the Stags. His arrival heralded the start of an upturn in the teams performance. They began to win games they previously would have lost and to show spirit that had long since been considered absent. The club commemorated this with their 'Great Escape' merchandise - T shirts and posters and running out to the popular film tune. The conclusion - a fantastic game against Huddersfield, the result sealed with a fine strike from the No.11 - Kevin Nicholson. Things could only get better. Couldn't they ? 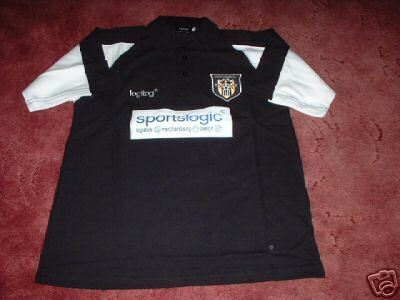 Administration may have been just round the corner but a visit to the club shop as the Pies unveiled their new kit revealed a veritable Santa's Grotto of leisurewear topped by the last decently-made shirt the team would see for a good couple of years.The increase in width of the black stripes was not to everyones taste but the trimmings on the sleeve and the quality of the badge were all to be admired. 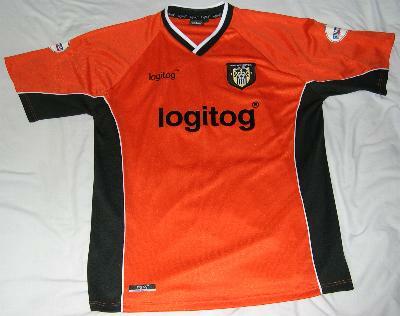 In the early part of the season there was no sponsors name - the 'Logitog' yellow lettering would come later. The actual players shirts, unadorned as above, were available in the club shop after the season ended but unfortunately they were not the ones worn for most of the games. Those - distinquished by the yellow felt Logitog sponsors logo, went home with the players. Kevin Nicholson, who scored the clubs last and most important goal of the campaign, allegedly threw his away ! Others though, gave theirs to friends and fans and several have come up for sale subsequently. Some belonging to loanees who had left by the end of the 'Great Escape' did end up being sold in the shop. If you do have a players shirt like the one above though,, it was more than likely just used in the early fixtures including the game against West Ham Utd pre-season. The away kit was one of the most popular of recent times. Certainly not many crop up for sale in comparison to others. The idea of side panelling carried over to the following seasons yellow shirts but the white was certainly better quality. The players shirts did appear in the club shop and were sold off at the seasons end. Their generous sizing meant they served equally well as dresses and small tents. 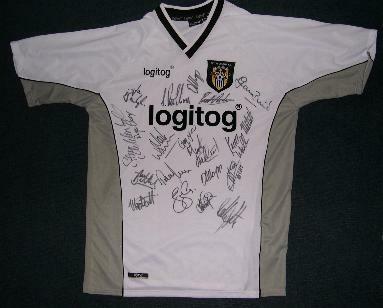 The shirt above was one of many sold during the season that was signed by all the 'Great Escape' squad including the three main strikers - Stall, Allsopp and Paul Heffernan - the latter coming to prominence in this year after an injury to Stallard sidelined the first choice during the crucial spring revival. The third shirt was rather similar to the away strip of the previous season. It was orange in colour (although slightly darker) but without the black band going across. 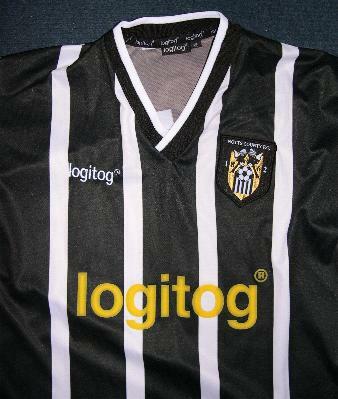 It was produced commercially as a replica after the deal with sponsors Logitog had been signed. The players shirts, as with the away kit, came up in the club shop for sale. The third team shirt - this one belonging to Ryan Ford and therefore sporting white oval Nationwide epaulettes on the sleeve.. This home kit lay unwanted in the club shop until it was bought virtually last of all the homes of that year. 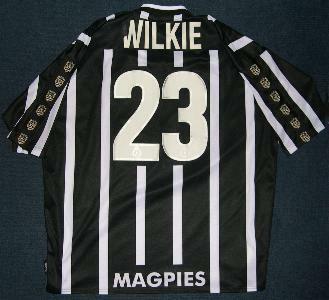 It was worn by Scottish international Lee Wilkie who later described his time with Notts as one of the lows of his career - thus joining the many fans who had argued that at the time. However, following his signing for Dundee he was picked for his country and represented them subsequently in their World Cup campaign. 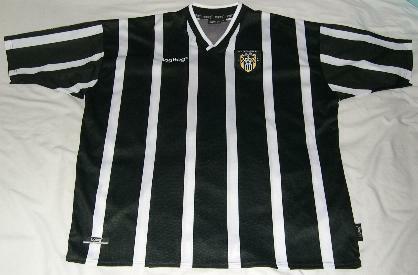 In terms of availability, the sponsored first team shirt was harder to come by than its plain earlier version which was abandoned when the season was only a few months old because of the Logitog deal. The team played out the rest of the 'Great Escape' in the new kit - this one. As players left during the campaign, it was possible to buy these in the shop but after the historic Huddersfield match, all the 'last day' team shirts went with their wearers and have only resurfaced in private hands on Ebay. Five years after the remarkable end to the season, quite a large quantity of home and away shirts popped up on Ebay for sale along with kits from preceeding years and training gear. It was all tagged and seemingly new. Dumped on the market in one go by several different dealers, it didn't do as well as it could have done. It was, though, all totally genuine old stock from a warehouse clearance. This site was happy to advise one of the traders and if you were one of the fans who bought this merchandise , you got a bargain ! Keep your purchase safe - these will crop up again as individual items on Ebay in the future but they'll make a lot more !